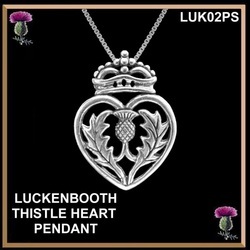 This exquisite sterling silver Luckenbooth is solidly made and features the prickly thistle, the emblem of Scotland. A perfect way to display your Scottish heritage and show your love! This item is in Brand New Condition......................but looks like it could be over 100 years old. Luckenbooths are wonderful gifts for the bride to wear on her wedding day. 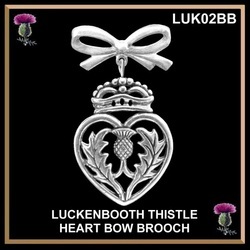 We make this very popular Luckenbooth in a variety of metals and designs . This Luckenbooth thistle design is 13/16" (21mm) wide and 1-1/8" (29mm) high. 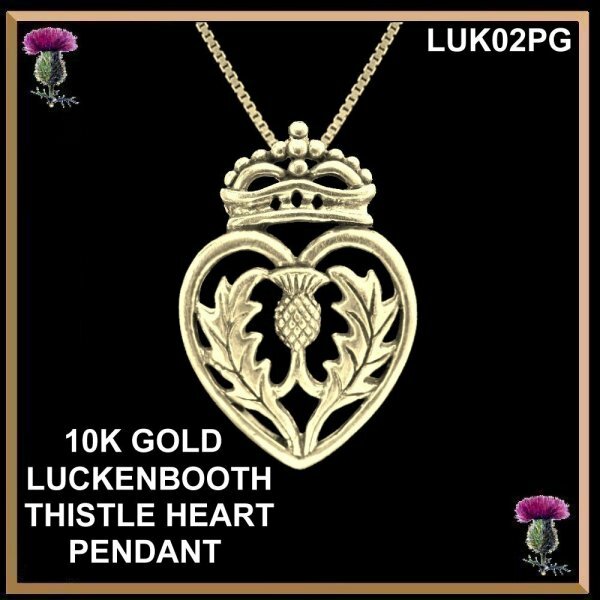 This Luckenbooth thistle pendant is 13/16" (21mm) wide and 1-1/8" (29mm) high. An 18" nickle plated chain is included. An 18" high quality sterling silver chain is included. The chain is not included but can be purchased separately. This Luckenbooth thistle brooch is 13/16" (21mm) wide and 1-1/8" (29mm) high and has a high quality nickle silver pin and catch. 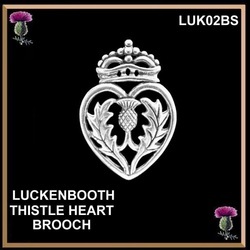 This exquisite Luckenbooth Thistle heart is solidly made in sterling silver. The bow is 1" (26mm) across and has a high quality nickel silver bar fitting to attach to a blouse or jacket. This design is also available in 10K and 14K solid gold. Please ask. 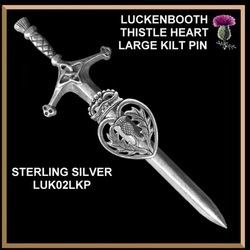 This antique design large Luckenbooth kilt pin is hand made in sterling silver with a secure high quality pin back. The overall length is 3-7/8” (99mm) and is 1-5/16” (34mm) across the handle of the sword. 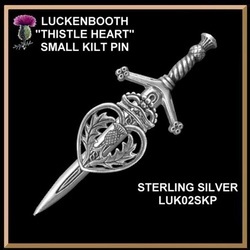 This thistle heart kilt pin is a smaller version of our larger kilt pin. The overall length is 2-3/4” (70mm) and is 1” (26mm) across the handle of the sword. The pin back is a one-part high quality nickel/silver bar pin for strength and security.